Whatever your florist's style or color scheme, we will design your florist website with your branding in mind. Everything from big and bold to small and simple! All of the services listed below are included with the Media99 Florist eCommerce package. See some of our florist website designs. From changing the categories displayed on your florist website to displaying a different banner for this week's sale, we've got you covered. You can call our office during business hours, or you can use our online support system 24/7. Our HelpDesk is a great resource for day-to-day questions and needs. We are also available on our social media outlets. The point is, there is a way to get help or answers to questions concerning your florist eCommerce business when you need them. Promote a summer rose sale to your customers or remind them of an upcoming holiday. Select from a variety of holiday and seasonally-inspired professionally designed banners and email marketing pieces from our online maintenance system or request a custom design based on your specific needs. We even handle the creative artwork aspect, saving you the time and effort required in most self-service email marketing programs. If you want to create your own images for banners or promotions, that's fine, too. Send us the image you want to use, let us know where you would like it placed, and we will make it happen. You can add as many floral products to your website as you wish. We do not limit on the amount of products on your florist website. You can also create your own product categories, again, with no limits. If your town has a special festival or celebration coming up, feel free to create a category and merchandise it with the products you want to sell. When you are ready, we make the category live on your website, and then we remove it based on your requests. Learn more about your florist products with Media99. We provide full hosting and maintenance services, and we make the daily use of your florist website an experience both flower shops and consumers a pleasant one. Our cloud-based florist management software lets you access your website management tools from any platform, as long as you have a browser and internet access you can edit your website. We provide the complete package - all you need is a computer and an internet connection to put your florist eCommerce website to work for you. We have a florist-centered content management system in place to keep your florist website blooming with new content on a regular basis. This content isn't copied and pasted from other websites in an attempt to stuff keywords into your website's pages. It is written by our staff who have compiled the information from credible sources. 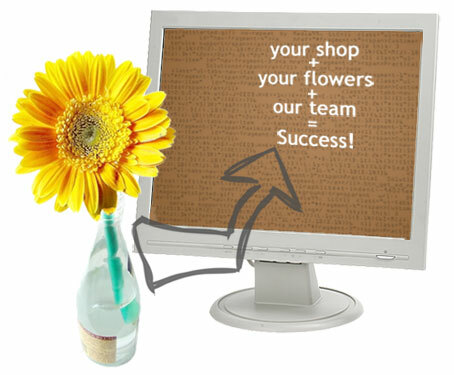 This makes you not only the best local florist in your area, but an online resource they know and trust. We integrate with many popular Point of Sale systems. Click here to see the full list. We do not sell a POS, and do not require you to use a specific system. If you currently do not have a point-of-sale, we suggest looking into one designed specifically for the floral industry, such as those listed above. Like us, they recognize the unique nature of the floral business and have designed their programs to work with those distinct characteristics. Included with every florist eCommerce package are five email accounts at your domain at no extra charge. * Want the address susie@your-flower-shop-domain.com? No problem! Conveniently check your email on any computer using our web-based client, not to mention the hundred of mobile email clients available, no matter if you're in the shop or on the road. You can also step through our configuration wizard to set up Outlook, Thunderbird, and many other popular email clients. Expand your on-the-go capabilities with our optional MobileSync, which will check and sync your email to your smartphone. * Additional accounts are available at a minimal charge. As a part of every florist eCommerce website we design are the industry best-practices for local SEO results. The meta data tools within SiteWorks also give you the ability to fine-tune and adjust your meta tags even further. With our dedicated, on-staff SEO services, you can be involved with the SEO of your site as much or as little as you prefer. From as minimal as answering the occasional question to advanced, fully-managed SEO, we aim to help your website be visible in the sea of online businesses. Along with targeted local SEO, our content management system adds to the relevancy of your websites information and keep you up to date. Using the most complete tools available in today's florist industry you will be able to track online traffic and customers from virtually every aspect. Download or view reports, or create your own reports to encompass the statistics that are most valuable to you. Monitor everything from keywords to user paths to referrals to conversions, and even discover what customers are typing in your websites search box! We offer over-arching florist eCommerce analytics reporting, and can even incorporate free services like Google Analytics into your site.